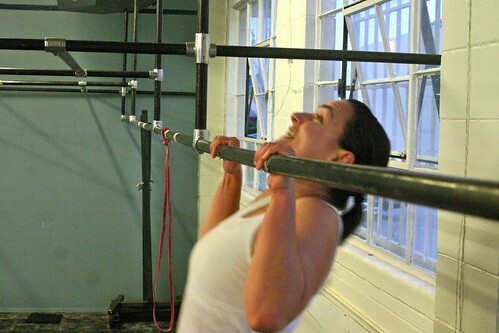 Hells Yeah, Suzy gets her first unassisted Pull up yesterday! We talk a lot about scaling and keeping the intensity up, and we want you to know why. More weight or a super short workout does not mean that you didn’t get as good of a workout. We need to be able to define intensity so we can understand the art of scaling. Remember that our definition of fitness is Increased Work Capacity Across Broad Time and Modal Domains. Even after 18 months of dedicated training, every day I am still humbled, as workouts of the day (WODs) appear which I know I cannot perform as prescribed (RX’d). I have come to accept scaling is okay. There is a much greater chance I will avoid injury by not pushing myself to RX a workout I know I cannot. In the long run, I will finish all the workouts and make more gains than I would have, had I struggled to lift more than I could. This reality of “scaling” was not clear to me during my first few months of CrossFit. To feel competitive with everyone else at CrossFit Providence, I wanted to RX, or try to RX everything that came my way. In the process, I tried to do some far too heavy technical lifts and ended up with a shoulder injury which took months to go away. There is no shame in scaling. When I finally realized this I took weight off the bar, and worked on technique to move less weight faster. The result? More gains, much faster. It is tough to realize you need to scale, especially if you are chock full of hormones and have an “if he/she can do it, so can I!” attitude. It takes a serious gut check, but CrossFit is humbling and egos need to be left at the door. So why scale? By scaling weight, you actually will generate more power thereby increasing work capacity, or the maximum amount of work a person can perform. Increasing work capacity is the overall goal of CrossFit. Simply put: move less weight, at faster speeds, and increase fitness (work capacity). What does all this mean? Basic physics explains all of this. Luckily I teach Physics! The two concepts we need to understand are Power and Work. Work is equal to Force times distance. The weight of something times how far it is moved. So if I move a 10 pound dumbbell 10 feet, the work is 100. Power is the amount of work done divided by time. Using the example from above, if moving that 10 pound dumbbell 10 feet took 2 seconds, my power is 50. Let’s relate this to scaling. I come into the box and the workout is Fran. Fran Rx’d for guys is 95 pound thrusters, in a rep scheme of 21-15-9. Let’s just look at the first set of 21. If I was to Rx the workout, I need to move 95 pounds from a front squat position to overhead, a distance of approximately 5 feet, 21 times. My work therefore is 95 pounds x 5 feet x 21 reps, for a total of 9975. Say it takes me 2 minutes (120 seconds) to accomplish this set, because 95 pound thrusters are heavy for me. My Power is 83 for that set. Not bad, but what if I scaled to a weight more appropriate? Suppose I used 65 pounds instead of the Rx’d weight. 65 pounds x 5 feet x 21 reps gives me 6825 amount of work. Less work, however, I can accomplish this task in 1 minute (60 sec). 6825/60 gives me a power of ~114, 37% more Power output. Another example is Grace, 30 Clean and Jerks at 135 lbs. Last time I did Grace it took me 5 minutes, as I Rx’d it. Looking back I probably should have scaled. Let’s look at the math! If I had scaled the weight to 95 pounds and finished in 3 minutes? Less weight, but more power, means greater fitness outcomes. Amazing! Numbers do not lie. The next time a WOD appears where your ego is saying Rx it, but your gut is saying, if I do this weight it will take me forever, drop the weight, move the lower weight faster, and make more gains!